This item will be available soon. Every year Christian church goers hear the same Scripture stories over and over again. Every year they celebrate the same feasts and liturgical seasons. Why? What is the purpose of the Liturgical Year? In this illuminating book, Joan Chittister explains that the liturgical year immerses us over and over again in the sense and substance of the Christian life until, eventually, we become what we say we are—followers of Jesus all the way to the heart of God. It is an adventure in human growth; it is an exercise in spiritual ripening. 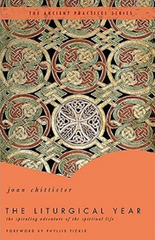 FROM THE FOREWARD Sr. Joan Chittister, much loved author and counselor and fond voice across the divisions of Christendom, is uniquely—I would argue, providentially—positioned to talk to us about the centrality of the liturgical year to our practice as individual Christians and as the church. A Benedictine by profession, she has lived the liturgical year with faithfulness for all of her own physical ones and, as a result, has learned to hold its observations and governances in both affection and respectful awe. What Sister Joan gives us in her discussion here is part historical instruction, part Christian mentoring, and part gentle wisdom. Nowhere, though, is she in the business of persuading us—she’s far to seasoned a believer for that. Rather, Sr. Joan would have us engage with affection and comfort the questions about what this particular gift from the fathers and mothers of the faith really is. Only after we have done that can any one of us hope to discern where, in the coursings of our lives, this practice may or may not inform us to our soul’s benefit.